>>Click here for the official website of the Texas Blueberry Festival. 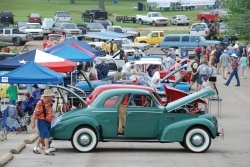 The Texas Blueberry Festival presented by Tipton Ford-Lincoln is a delightful day of good old-fashioned family fun! This year marks the 30th anniversary of the most delicious festival in the Lone Star State. As the only state-sanctioned blueberry festival in Texas, this delicious annual event attracts more than 20,000 people to Nacogdoches’ historic downtown district. The festival opens early on June 8 and serves as the anchor event for a weekend packed with sweet activities throughout Nacogdoches County, all inspired by the mighty blue super fruit. Prime growing conditions make East Texas one of the leading blueberry producing areas in the state, and the annual harvest peaks in early summer. In 1989, Nacogdoches residents Leon and Patsy Hallman coordinated community leaders and volunteers to plan an affordable, family-friendly event that highlights our downtown businesses and attractions, while celebrating and promoting the unique local industry. Festival events include a Hug a Hero booth, where festival guests may personally thank first responders, veterans and elected officials for their service and sacrifices, a blueberry pancake breakfast, pet parade, car show, bounce park, kids make-and-take craft corner, blueberry pie eating contests, cooking demonstrations, the Blueberry Hill Soda and Sweet Shoppe, Running of the Blueberries 5K fun run, a 42 tournament, and a washer pitching tournament. Enjoy three stages of live entertainment and tons of food, craft and product vendors that line the streets and Festival Park. To make the festival even sweeter, most of these events are free of charge! Downtown merchants and local businesses offer blueberry specials, and thousands of pounds of fresh Texas-grown blueberries are sold at the festival, or take one of the free shuttle rides to a local blueberry farm for a pick-your-own experience. Kick off your weekend on Friday evening in Festival Park at the Blueberry Bluegrass Concert in the Park, featuring traditional bluegrass music for the entire family. Bring your blanket! Free admission. Proceeds benefit the Nacogdoches County Chamber’s various community and business development programs.